Hey everyone. Today I wanted to share a highly-requested topic: My Skincare Routine! Your skin is the largest and one of the most important organs on your body so it only makes sense to take care of it just like you would exercise your muscles and eat well to promote better function of your insides. I don't have perfect skin, but one thing I've learned is that taking care of your skin today can help reduce chances of scarring or blemishes tomorrow. Here's my current skincare regimen and how I modify it to target a variety of different skin issues. Because I have rather sensitive and acne-prone skin which has a tendency to hyperpigmentation, I frequently modify my routine to adjust to my skin's personality that day. Obviously everyone's skin is going to be different and the exact products that work on me may not work for you, but with the hope that it might be helpful as a general guideline, here are my routines categorized by skin condition. When my skin is particularly broken out or oily, I like to break it down to just the basics, plus an acne fighter. If my skin feels balanced and not too dry, oily, or broken out, I like to add in my "maintenance" products. On occasion, typically when I haven't exfoliated in a while, my skin will become slightly rougher and tougher. These are the occasions when I make sure to add in the deep-cleansing steps. After exfoliating, I load up on the skincare goodies because exfoliation helps products to absorb into the skin better. If my skin is dry or flaky, I like to start with gentle exfoliation, then focus on layering hydration. I skip toner altogether. Readers, what are your holy grail skincare products? Do you adjust your routine based on your skin condition? Let me know in the comments! Wow, that's a lot of different products on your skin. Do you find that it helps with the sensitive breakouts? I also have asian, sensitive, hyperpigmentation skin, and used to use a lot of products. After visiting a few different dermatologists, they all recommended that I pull back on products, because it was disturbing the phd layer on my skin, making my skin over compensate and taking away the top skin layer immunity. I've been using this for almost 1 years, haven't deviated from it and hands down it is my holy grail routine. I've stopped breaking out completely, and my old acne scars are all almost gone, and my sensitive skin has really calmed down. My skin now glows and everyone asks what I do. My dermatologist says, the less I mess with my skin, the more chance it has of healing itself, and I'm really starting to believe that! I agree that less is more! When everything is written out (including skincare brushes, exfoliators, etc) it seems like a complicated process but most days, I stick with face wash, essence, and moisturizer. LA air is really dry so I found the essence has been helping to balance my skin so much better than just the moisturizer itself. Hi Jen, can you recommend any good, quality eye creams at a lower price point? I just can't afford the Clinique Repairware but am looking for something that works just as well. Thanks! Personally, I'd recommend Body Shop Vitamin E eye cream. I travel a bit for work, and always keep this little tube in my travel kit. It doesn't work wonders by any means, but it is gentle enough to not irritate my skin, and does a decent job with hydration. It's simple, basic, but effective. Hello, Ive been watching your videos since, way back then. Im just extremely curious on what happened to the mole on your lip? can you elaborate on what you did to remove it? It actually faded with time. I'm guessing I had some sort of lip trauma which made it appear one day randomly and it stayed for about 7 years. I was shocked when it started fading pretty quickly (within half a year) until it was completely gone! Pretty strange! haha u r so funny - the last part "lucky husband"..
What do you do with milium/millia/oily bumps? I can't get rid of them! I've only had personal success getting them professionally removed/extracted by an esthetician, unfortunately! There are topical things you can do, but it's essentially burning off the bump so I'd much more trust a pro around the sensitive eye area. Totally agree with Jen on this! Don't do this yourself, it increases your chance for scarring. Have it professionally taken care of! Jen, can u respond for this comment...? 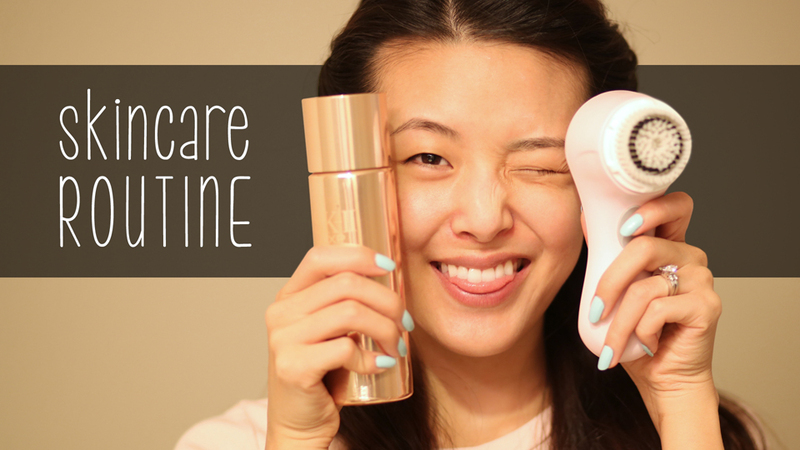 I seriously love the clarisonic mia! do you have a facial mask recommendation for dry/patchy/flakey skin that would be okay to use with breakouts as well? Thanks for replying! I'll definitely check those out once I receive my paycheck.. hahaha. actually my skin condition pretty much same with you. I got acne all year long, different is i live in tropical yet dry country, so most of the time i'm struggling finding good oil free moisturizer. Poor me my choice always "hit"my acne prone skin badly. i'm eyeing that clinique moisture surge intense that you mention, but there's several type for this cream, which one the oil free type you mean? I was wondering if you think it is worth my money to buy the Clarisonic Mia , i have a pretty good skin (only blackhead around my nose and some bumps around my jaw line).. do you think the Clarisonic will do something for me? Maybe I need to get a clarisonic! I've had the mario badesco drying lotion for a while. I wonder when they expire..
Hmm, I actually have no idea when they expire since I go through mine before I've been nervous about it expiring. If I find out I'll let you know! hi, just to share, it's kinda recommended to first put on the eye product before the face products as the size of the molecules of face products are bigger than the ones for eyes. Thus when u apply your face products first, you don't know how much residual on your fingers are transferring to your eyes. Hey Jen, have you tried Konjac sponges? I just started using the Boscia one, and my skin feels baby soft. My pores are a lot smaller, and my skin is less oily. Maybe you can review it when you get a chance. The PMD definitely helps a lot with lightening scars but one topical product I like is Mario Badescu Vitamin C serum. Make sure you also are wearing a good facial sunscreen everyday to prevent darkening of scars as well! First off, I love watching your videos because it caters to the monolided girls such as myself and has helped much with my self-esteem! skin care was also a big topic, so I got myself organic beauty products from the German Label Dr. Hauschka and Martina Gebhard. My skin never had been so good and healthy! How bout you? wanna try going organic? its a big step, and I know, that its not easy to stop eating and only drink for days.. but its worth it and you can always stop. Dr. Hauschka follows an own way of beauty: reactivating the healing power from your skin and not layering all those products ontop (your skin then tends to forget how to take care of itself and becomes addicted to the products). btw: I did stop to use all those products at night, I wash my face with a gentle product, then pad some tonic/herb water on it, no rich hydrating cream, only a hint of eye cream, and then go to bed. I've been a long time viewer of your blog, but never leave any comments. However, I felt compelled to tell you about some of the bad press Mario Badescu is facing right now. I've been a long time loyal customer of MB, until recently when I found out that they use steriods (without listing them in the ingredients list). I've been using their Healing Cream for over 10 yrs! I can't say if they do this with all of their products, but the Control Cream is another one suspected of containing strong steriods, you can find discussions on it on the products Amazon page as well. Hi Jen! Your videos have helped me so much. I was wondering if you could recommend me some good products for blackhead/ visible pores. I have big, visible pores around my nose that I hate. I'll try out the Clarisonic and exfoliator you mentioned in the post, too! Hi Jen! All of your tutorials have been great help and especially this one specifically on how to take care of the skin so much. The products you use seem really great since they work so well for you however I live in Pakistan and most of these products, actually none of these products are available. The best we have is a legit Body shop which i absolutely love! I've bought all my makeup products, right down to the very last lipstick, from there. We do have a lot of other companies as well but Body Shop has suited me pretty okay so far. Do you suggest that I continue using it? Or should i reach out to other companies? and if so then which ones are good? Hey Jenn, love ur blog and I've picked up many good makeup tips! Just to trade secrets with you, do try 3M pimple patch (http://www.makeupalley.com/product/x_showreview.asp?ItemId=112871&3M---Nexcare-Acne-Patch&Unlisted-Brand&Treatments) for white heads. They are awesome as they draw the gunk out of ur skin when you sleep, especially the nasty ones which are embedded deep within the skin. I use it often to reduce pimple swelling and lighten the nasty red/brownish residue spots. Thank you for these great article. This blog is very interesting. I'm always usingSakare's moisturizers products to improve my skin. Thanks for sharing your skincare routine, and for being so honest about your previous difficulties, although I think your skin has always looked gorgeous! Finding skincare products that work can be a lot of trial and error so it’s always great to hear other people’s recommendations. I definitely have minor scarring and pigmentation due to past skin troubles,for this i use Dermology anti aging solution and its fade them on my face.